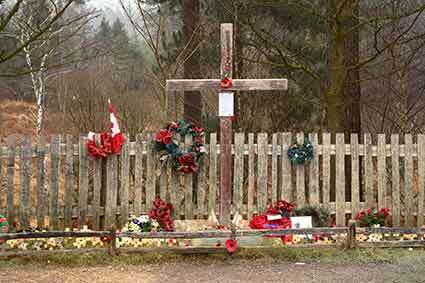 The Canadian Memorial is a simple wooden roadside cross overlooking sloping ground, close to the Bolderwood Deer Sanctuary - it is beside the minor road leading from Emery Down, not far from the A31 underpass. (Note: access to / from the A31 is not available here). The Canadian Memorial recalls World War Two Canadian forces present in the New Forest before the D-Day invasion of June 6th, 1944 - the first day of landings at the start of the Allied invasion of Normandy, a momentous assault on German-occupied France. At this site, during the build-up to D-Day, Canadians of all denominations who were stationed in the area would regularly gather for church services. A plaque with inscription reads: ‘On this site a cross was erected to the glory of God on 14th April 1944, by men of the 3rd Canadian Division RCASC’ - the Royal Canadian Army Service Corps. (On D-Day, RCASC soldiers of the 3rd Canadian Division and 2nd Armoured Brigade landed on Juno Beach, suffering fourteen fatal casualties on that day and many more in the weeks and months that followed). At the beginning of 2009, the following poignant lines by Betty Whitcher remained pinned to the cross - they can perhaps best be appreciated by reading them on site, in this once lonely part of the New Forest. gave their lives for us, and who in foreign fields now lay. husbands, sons and brothers, and as they left, we never knew their fear. of how they sailed away then to face a mighty foe. they were the grandest bunch of men you could ever wish to meet. They had to end the tyranny for children yet unborn. we fought for what we knew was right, we can do it yet again. with heads held high and medals gleaming, what a picture they did make. I saw them stand, remembering, the grief they had to share. they would never know the peace we have, would never know the joys. until our memories fade away and we stand with them, side by side.